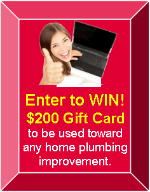 Uneasy When Choosing a Company to Fix Your Clogged Drains? I Don't Blame You. Sewer and drain repairs and replacements can be expensive. You want to be sure you're getting value for your dollar. You want to be sure you're not getting sold more than you need. You want to be sure the job is done right -- the first time. After all, you'll be living with the consequences for years. Many sewer and drain cleaning companies are franchises. There may not be a license plumber in the entire company. If that's the case, they may not be able to do more than merely clear your line. If there's a break or if your line needs replacement, they will not be able to help you. If there is a plumber with the company, more often than not he's not likely to put in more than the minimum six hours of continuing education each year that Massachusetts requires to maintain his license. That's nowhere near enough to keep up with the technological advances that have been coming our way. Your Cape Cod Sewer and Drain technician is part of a team that includes fully license plumbers who spend more than 100 hours in continuing education each year. Our plumbers are schooled and equipped in our industry's state-of-the-art "Green" technologies. If the company you call doesn't have a full range of routers, a water jet system and chemical treatments, they may not succeed in clearing your particular clog. If they are able to repair or replace your lines, they may not have video line inspection equipment. If that's the case, they may end up digging up large sections of your yard before they locate your break. They may even dig up your yard only to find that there isn't a break at all. Our video inspection allows us to identify the exact location and nature of the problem. This saves a lot of disruption to your property and plantings. If you're dealing with one of the large companies, the technician's training is often as likely to be sales techniques and high-pressure closing tactics as it is in plumbing skills.Whenever I'm making a large investment in my home, I want to be sure that the guy designing it has the most knowledge and my interest -- not his commission -- in mind. Despite Tim's 14 years in the trade, his technicians average 12 years and his apprentices 5 years experience. Tim and this team spend more than 100 hours in continuing education each year. They are schooled and equipped in their industry's state-of-the-art "Green" technologies. From day one, I have been determined to build the kind of company with which I would want to do business. I hate high pressure, games and manipulation. As a home and business owner, I want to know the facts and to base my decisions on the merits. I want to pay a fair price, but I don't mind paying a little more to work with an educated professional who is more interested in a long-term relationship than with a quick sale. Like any business person I want to build my company, but not at the expense of my customers. What I like about my business is personal contact with customers who will come back year after year for my advice. I love using my expertise to design the absolutely best performing most advanced planet-friendly energy-saving systems for my neighbors. I want to have the kind of growth that comes with their returning business and with the friends and neighbors they refer. I invite you to take some time to learn about the measure's I've taken to create the kind of company with which I would be comfortable doing business. I trust that you'll share my excitement about Cape Cod Sewer and Drain and its parent company Cape Cod Master Plumbers Inc.